I really do feel bad about not blogging enough! Now that I have got that out of the way, let me move on to the topic at hand. I do know that the title of this post sounds quite dreary, but I really could not think of any other, it really has been very long since I have blogged. Moving on, we all know what SMM means. It is because of SMM that you are currently reading my post (well most of you atleast), so I shall refrain from explaing and just point you to a link, just in case, and move on. I am not really the most active person on Twitter, but I am an active follower. In short, I use it more for reading than for writing. I do love the concept of SMM and think it is extremely powerful. A couple of days back, my friend @Achint alerted his 500 odd followers about an ongoing conversation on Twitter. The think you should know about Achint is that apart from being my friend, he is also a founder member of the Social Media Club – Mumbai (SMC). So he does know a thing or two about SMM. Anyway, the conversation was truly interesting and showed how powerful SMM is and the fact that Indian brands are catching up! This is how it all began – Mr. X wanted buy a TV and asked all his friends on twitter for suggestions on where he should buy it from. He got a few replies from his friends pointing him to a Vijay Sales as you can see below. An hour later he got tweeted by Just Dial asking him if he wants to know his way to the nearest Vijay Sales Store! That was quite nice! But it did not end there. 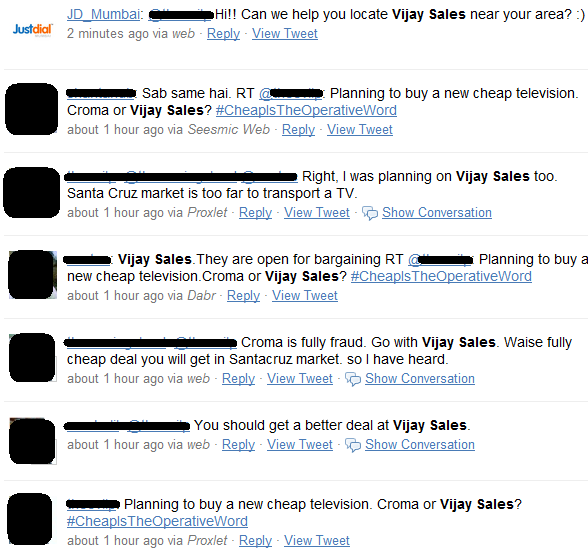 It seems Vijay Sales has a twitter handle too and do their own ORM. Detecting that people have been talking about it, they dived right in as you can see below. Now, this was awesome! They tried to help him find a brand and model, but not once did they tell him to come to the store. Polite, friendly and cool. The conversation went on for a little while more and ended with ‘thank you’ all around. This ensures that Mr. X will not go anywhere but Vijay Sales. Atleast I would not go anywhere else. If you have experienced something similar and would like to share please do leave your comments. I would surely be posting more frequently on SMM from now on. It is a topic that deeply interests me and I really do believe that it is the future of all things. If you are interested in SMM please do join the SMC where Achint and others are going to talk more in detail regarding this example and more. PS: I would like to thank Achint for the screenshots, the botched up masking job however is mine. Thank you for the above review 🙂 We believe that people need prompt responses coupled with great discounts at their convenience. We simply do our best to answer our belief. Thanks Deepti. Sure, you can feature the post. Do give credit to the respective people involved though.Thanks!